Other Names*: Cora Fortson Self, Cora Self. [S27] John Wright Boyd, A Family History: Lt. Thomas Fortson (1742-1824) and Some of His Descendants—Early Settler of Elbert County, Georgia (Danielsville, Ga.: Heritage Papers, 1973), p. 146 (naming Thomas Edmond Fortson as her father). [S27] John Wright Boyd, A Family History: Lt. Thomas Fortson, etc., above, p. 146 (naming Nancy Elizabeth Scarborough as her mother). Christopher Columbus Fortson's tombstone, Shiloh Baptist Church Cemetery, Shiloh, Ga., courtesy of Ed Saye. [S27] John Wright Boyd, A Family History: Lt. Thomas Fortson (1742-1824) and Some of His Descendants—Early Settler of Elbert County, Georgia (Danielsville, Ga.: Heritage Papers, 1973), p. 146 (naming Thomas Edmond Fortson as his father). [S27] John Wright Boyd, A Family History: Lt. Thomas Fortson, etc., above, p. 146 (naming Nancy Elizabeth Scarborough as his mother). [S27] John Wright Boyd, A Family History: Lt. Thomas Fortson, etc., above, pp. 146, 147. [S961] Find A Grave, online at http://www.findagrave.com, memorial for Christopher C. Fortson, memorial no. 64392430, viewed on 11 Jan 2013. [S27] John Wright Boyd, A Family History: Lt. Thomas Fortson, etc., above, p. 147 (giving his name as Columbus (Lump) Fortson). 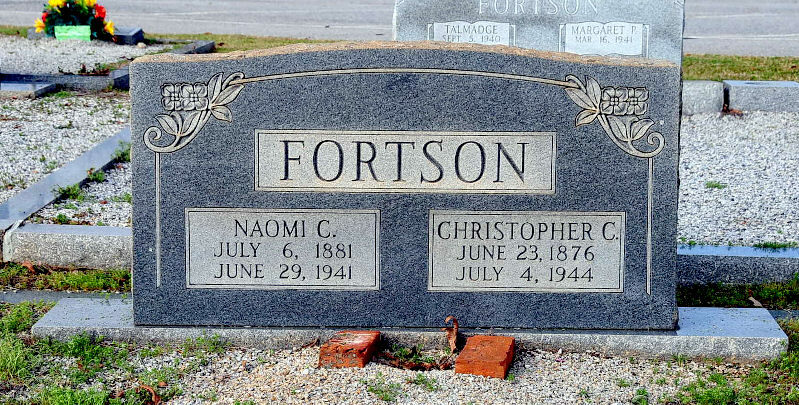 [S961] Find A Grave, online, above, memorial for Christopher C. Fortson, memorial no. 64392430, viewed on 11 Jan 2013 (giving his name as Christopher C. Fortson). [S27] John Wright Boyd, A Family History: Lt. Thomas Fortson, etc., above, p. 147 (naming Columbus ('Lump') Fortson as his father). [S27] John Wright Boyd, A Family History: Lt. Thomas Fortson, etc., above, p. 147 (naming Columbus ('Lump') Fortson as her father). [S27] John Wright Boyd, A Family History: Lt. Thomas Fortson, etc., above, pp. 146 (giving the date but no other information), 151. [S961] Find A Grave, online at http://www.findagrave.com, memorial for John L. Fortson, memorial no. 64436653, viewed on 25 Dec 2012 (giving the year but no other information). [S27] John Wright Boyd, A Family History: Lt. Thomas Fortson, etc., above, p. 151. [S961] Find A Grave, online, above, memorial for John L. Fortson, memorial no. 64436653, viewed on 25 Dec 2012. [S27] John Wright Boyd, A Family History: Lt. Thomas Fortson, etc., above, pp. 151-52 (naming John Lacy Fortson as his father). [S27] John Wright Boyd, A Family History: Lt. Thomas Fortson, etc., above, p. 151 (naming John Lacy Fortson as his father). [S27] John Wright Boyd, A Family History: Lt. Thomas Fortson, etc., above, p. 151 (naming John Lacy Fortson as her father). [S961] Find A Grave, online, above, memorial for John Lacy Fortson, memorial no. 146452165, viewed on 30 Nov 2017 (naming John Lacy Fortson as his father). [S27] John Wright Boyd, A Family History: Lt. Thomas Fortson (1742-1824) and Some of His Descendants—Early Settler of Elbert County, Georgia (Danielsville, Ga.: Heritage Papers, 1973), pp. 146, 153 (naming Thomas Edmond Fortson as his father). [S27] John Wright Boyd, A Family History: Lt. Thomas Fortson, etc., above, pp. 146, 153 (naming Nancy Elizabeth Scarborough as his mother). [S27] John Wright Boyd, A Family History: Lt. Thomas Fortson, etc., above, pp. 146 (giving the date but not the place), 153 (giving the date and place). [S27] John Wright Boyd, A Family History: Lt. Thomas Fortson, etc., above, p. 153. [S27] John Wright Boyd, A Family History: Lt. Thomas Fortson, etc., above, p. 153 (attributing information to family bible in Early Fortson's possession) (naming King David Fortson as his father). [S961] Find A Grave, online at http://www.findagrave.com, memorial for Pvt. Alston Edmond Fortson, Sr., memorial no. 86400988, viewed on 4 Jul 2014 (naming King David Fortson as his father). [S27] John Wright Boyd, A Family History: Lt. Thomas Fortson, etc., above, p. 153 (attributing information to family bible in Early Fortson's possession) (naming King David Fortson as her father). [S1309] Kim Thomas, electronic mail to Roger Bartlett, 29 Jun 2014 (naming King David Fortson as her father). [S961] Find A Grave, online, above, memorial for Mary Elizabeth Fortson Smith, memorial no. 132062071, viewed on 4 Jul 2014 (naming King David Fortson as her father). [S1193] Standard certificate of death (Georgia State Board of Health, Bureau of Vital Statistics) no. 26656 for Unnamed [JAMES RUFUS] Fortson, filed with local registrar on 20 Oct 1922, King David Fortson, informant, per copy viewed on Georgia's Virtual Vault, http://content.sos.state.ga.us/cdm4/gadeaths.php, on 12 Jan 2009, (naming King David Fortson as his father) (the death certificate calls the child "Unnamed" Fortson, but it is clear from the birth and death dates that it is the child known in the family as James Rufus Fortson). [S961] Find A Grave, online, above, memorial for Emma Ruth Fortson Graham, memorial no. 132063288, viewed on 4 Jul 2014 (naming King David Fortson as her father). [S1250] Salisbury Post, Salisbury, N.C., online, www.salisburypost.com, <http://tinyurl.com/a4529yk>, 9 Jan 2013, viewed 11 Jan 2013 (obituary of King Junior Fortson) (naming King David Fortson as his father). [S961] Find A Grave, online, above, memorial for Janice Fortson, memorial no. 99880231, viewed on 4 Jul 2014 (naming King David Fortson as her father). Marriage*: She married Ben Bryant. Other Names*: Martha Jane Fortson Bryant, Martha Fortson, Martha Jane Bryant, Martha Fortson Bryant, Martha Bryant. [S27] John Wright Boyd, A Family History: Lt. Thomas Fortson (1742-1824) and Some of His Descendants—Early Settler of Elbert County, Georgia (Danielsville, Ga.: Heritage Papers, 1973), pp. 146, 156 (both naming Thomas Edmond Fortson as her father). [S27] John Wright Boyd, A Family History: Lt. Thomas Fortson, etc., above, pp. 146, 156 (both naming Nancy Elizabeth Scarborough as her mother). [S27] John Wright Boyd, A Family History: Lt. Thomas Fortson, etc., above, pp. 146 (giving the date but not the place), 156 (giving the place but not the date). [S27] John Wright Boyd, A Family History: Lt. Thomas Fortson, etc., above, p. 156-57 (naming Martha Jane Fortson as his mother). [S27] John Wright Boyd, A Family History: Lt. Thomas Fortson, etc., above, p. 156 (giving her name as Wreatha Bryant and naming Martha Jane Fortson as her mother). [S27] John Wright Boyd, A Family History: Lt. Thomas Fortson, etc., above, p. 156-57 (naming Martha Jane Fortson as her mother). [S27] John Wright Boyd, A Family History: Lt. Thomas Fortson, etc., above, pp. 147, 156 (both naming Martha Jane Fortson as his mother). [S27] John Wright Boyd, A Family History: Lt. Thomas Fortson (1742-1824) and Some of His Descendants—Early Settler of Elbert County, Georgia (Danielsville, Ga.: Heritage Papers, 1973), pp. 146, 157 (both naming Thomas Edmond Fortson as his father). [S27] John Wright Boyd, A Family History: Lt. Thomas Fortson, etc., above, pp. 146, 157 (both naming Nancy Elizabeth Scarborough as his mother). [S27] John Wright Boyd, A Family History: Lt. Thomas Fortson, etc., above, pp. 146 (giving only the date), 157 (giving the date and place). [S961] Find A Grave, online at http://www.findagrave.com, memorial for William R. Fortson, memorial no. 98148613, viewed on 13 Jan 2013 (giving the year but no date or place). [S27] John Wright Boyd, A Family History: Lt. Thomas Fortson, etc., above, pp. 157, 186. [S961] Find A Grave, online, above, memorial for Ethel C. Fortson, memorial no. 98148785, viewed on 13 Jan 2013 (not giving the date). [S961] Find A Grave, online, above, memorial for William R. Fortson, memorial no. 98148613, viewed on 13 Jan 2013 (not giving the date). [S27] John Wright Boyd, A Family History: Lt. Thomas Fortson, etc., above, p. 157 (giving the date but not the place). [S961] Find A Grave, online, above, memorial for William R. Fortson, memorial no. 98148613, viewed on 13 Jan 2013. [S27] John Wright Boyd, A Family History: Lt. Thomas Fortson, etc., above, p. 157 (identifying the cemetery as Blue Stone Baptist Church). [S27] John Wright Boyd, A Family History: Lt. Thomas Fortson, etc., above, p. 157 (naming William Richard Fortson as his father). [S27] John Wright Boyd, A Family History: Lt. Thomas Fortson, etc., above, p. 157 (giving his name as Joy Sims Fortson and naming William Richard Fortson as his father). [S27] John Wright Boyd, A Family History: Lt. Thomas Fortson, etc., above, p. 157 (naming William Richard Fortson as her father). [S961] Find A Grave, online, above, memorial for Nina S. Fortson Furr, memorial no. 66594288 (naming William R. Fortson as her father). [S27] John Wright Boyd, A Family History: Lt. Thomas Fortson, etc., above, pp. 157-58 (naming William Richard Fortson as his father). Note*: • A family history gives 14 Feb 1885 as his birth date. • His Find A Grave memorial gives 8 Jan 1951 as his death date. [S961] Find A Grave, online at http://www.findagrave.com, memorial for Thomas J. Fortson, memorial no. 26811906, viewed on 25 Feb 2019. [S1513] U.S. World War I Draft Registration Cards, 1917-1918, online at https://www.familysearch.org, record for Thomas Jackson Fortson, serial no. 806, image no. 1127, viewed on 25 Feb 2019. [S859] James T. Lord, electronic mail to e-mail address, 13 May 2003. [S27] John Wright Boyd, A Family History: Lt. Thomas Fortson, etc., above, p. 160. [S27] John Wright Boyd, A Family History: Lt. Thomas Fortson, etc., above, p. 160 (first bullet). [S961] Find A Grave, online, above, memorial for Thomas J. Fortson, memorial no. 26811906, viewed on 25 Feb 2019 (second bullet). [S27] John Wright Boyd, A Family History: Lt. Thomas Fortson, etc., above, p. 160 (naming Thomas Jackson Fortson as his father). [S859] James T. Lord, electronic mail to e-mail address, 13 May 2003, (naming Thomas Jackson as her father). [S859] James T. Lord, electronic mail to e-mail address, 13 May 2003, (naming Thomas Jackson as his father). [S960] Athens Banner-Herald, Athens, Ga., online, 28 Nov 2004, obituary of Charlie Homer Fortson at https://tinyurl.com/yy7thhj7, viewed on 25 Feb 2019 (naming Thomas Jackson Fortson as his father). [S27] John Wright Boyd, A Family History: Lt. Thomas Fortson (1742-1824) and Some of His Descendants—Early Settler of Elbert County, Georgia (Danielsville, Ga.: Heritage Papers, 1973), p. 146 (naming Thomas Edmond Fortson as this child's father). [S27] John Wright Boyd, A Family History: Lt. Thomas Fortson, etc., above, p. 146 (naming Nancy Elizabeth Scarborough as this child's mother). Note*: His name may have been Thomas Franklin Baker. [S27] John Wright Boyd, A Family History: Lt. Thomas Fortson (1742-1824) and Some of His Descendants—Early Settler of Elbert County, Georgia (Danielsville, Ga.: Heritage Papers, 1973), p. 168. [S27] John Wright Boyd, A Family History: Lt. Thomas Fortson, etc., above, p. 168 (naming John Thomas Baker as his father). [S27] John Wright Boyd, A Family History: Lt. Thomas Fortson, etc., above, p. 168 (naming John Thomas Baker as her father). [S27] John Wright Boyd, A Family History: Lt. Thomas Fortson (1742-1824) and Some of His Descendants—Early Settler of Elbert County, Georgia (Danielsville, Ga.: Heritage Papers, 1973), p. 168 (naming John Thomas Baker as his father). [S27] John Wright Boyd, A Family History: Lt. Thomas Fortson, etc., above, p. 168 (naming Mary Chandler Fortson as his mother). [S27] John Wright Boyd, A Family History: Lt. Thomas Fortson, etc., above, p. 168. [S27] John Wright Boyd, A Family History: Lt. Thomas Fortson (1742-1824) and Some of His Descendants—Early Settler of Elbert County, Georgia (Danielsville, Ga.: Heritage Papers, 1973), p. 168 (naming John Thomas Baker as her father). [S27] John Wright Boyd, A Family History: Lt. Thomas Fortson, etc., above, p. 168 (naming Mary Chandler Fortson as her mother). [S27] John Wright Boyd, A Family History: Lt. Thomas Fortson (1742-1824) and Some of His Descendants—Early Settler of Elbert County, Georgia (Danielsville, Ga.: Heritage Papers, 1973), p. 173. [S27] John Wright Boyd, A Family History: Lt. Thomas Fortson, etc., above, p. 173 (naming Martha Elizabeth Sartain as his mother). [S27] John Wright Boyd, A Family History: Lt. Thomas Fortson, etc., above, p. 173 (naming Martha Elizabeth Sartain as her mother). [S27] John Wright Boyd, A Family History: Lt. Thomas Fortson (1742-1824) and Some of His Descendants—Early Settler of Elbert County, Georgia (Danielsville, Ga.: Heritage Papers, 1973), p. 173 (naming Ben Ace Fortson as his father). [S27] John Wright Boyd, A Family History: Lt. Thomas Fortson, etc., above, p. 173. [S27] John Wright Boyd, A Family History: Lt. Thomas Fortson (1742-1824) and Some of His Descendants—Early Settler of Elbert County, Georgia (Danielsville, Ga.: Heritage Papers, 1973), p. 173 (naming Ben Ace Fortson as her father). [S24] Victor L. Bennison, The Loop Family in America (n.p. : Penobscot Press, 1992), p. 56. [S850] Linda Cyers, electronic mail to Roger Bartlett, 1 Jul 2003, (naming Nancy Craig as his mother). [S850] Linda Cyers, electronic mail to Roger Bartlett, 1 Jul 2003, (naming Nancy Craig as her mother). [S850] Linda Cyers, electronic mail to Roger Bartlett, 1 Jul 2003, (naming Andrew Jackson Loop as his father). 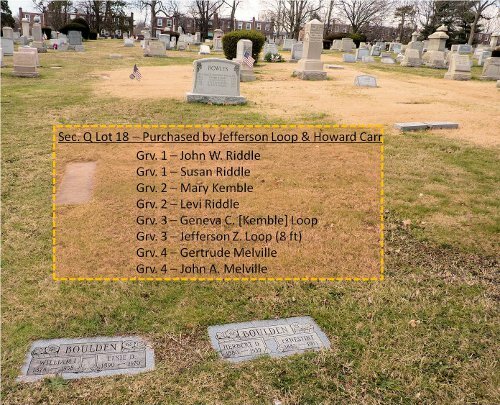 Jefferson Z. Loop's gravesite, Chester Rural Cemetery, Chester, Pa., courtesy of Bill Bloom. Lot 18 is unmarked save for the sill stone on the left. In this picture it lies in the area covered by the orange box, between the Rowles (top) and Boulden (bottom) lots. Click on the image to enlarge it. Other Names*: Jeff Loop, Jefferson B. Loop. [S961] Find A Grave, online at http://www.findagrave.com, memorial for Jefferson Z. Loop, memorial no. 82921405. Geneva Kemble Loop's gravesite, Chester Rural Cemetery, Chester, Pa., courtesy of Bill Bloom. Lot 18 is unmarked save for the sill stone on the left. In this picture it lies in the area covered by the orange box, between the Rowles (top) and Boulden (bottom) lots. Click on the image to enlarge it. [S850] Linda Cyers, electronic mail to Roger Bartlett, 1 Jul 2003, (naming Mary Riddle as her mother). [S850] Linda Cyers, electronic mail to Roger Bartlett, 1 Jul 2003, (naming John Kemble as her father). [S961] Find A Grave, online at http://www.findagrave.com, memorial for Georgia C. Kemble Loop, memorial no. 81796904. Marriage*: She married John Kemble. Marriage*: He married Mary Riddle. [S850] Linda Cyers, electronic mail to Roger Bartlett, 1 Jul 2003, (naming Andrew Jackson Loop as her father). [S851] Register of St. James Northam Parish, Goochland Co., Va., part 1, online http://ftp.rootsweb.com/pub/usgenweb/va/goochland/vitals/…, viewed 5 Jul 2003, attributing information to William and Mary College Quart. Hist. Magazine, vol. 15, no. 1 (Jul 1906), p. 35 (naming Richard Clopton as her father). The preface to part 1 reads in part: "This register, which was kept by Rev. William Douglas, is the property of R. Lee Traylor, Esq., of Memphis, Tennessee." [S851] Register of St. James Northam Parish, Goochland Co., Va., part 1, online, above, viewed 5 Jul 2003, attributing information to William and Mary College Quart. Hist. Magazine, vol. 15, no. 1 (Jul 1906), p. 35 (naming Mary Davis as her mother). [S27] John Wright Boyd, A Family History: Lt. Thomas Fortson (1742-1824) and Some of His Descendants—Early Settler of Elbert County, Georgia (Danielsville, Ga.: Heritage Papers, 1973), p. 175 (naming William J. O'Kelly as his father). [S27] John Wright Boyd, A Family History: Lt. Thomas Fortson, etc., above, p. 175 (naming Lucerida David as his mother). [S27] John Wright Boyd, A Family History: Lt. Thomas Fortson, etc., above, p. 175. [S27] John Wright Boyd, A Family History: Lt. Thomas Fortson, etc., above, pp. 175-76 (naming Rev. Marsassin Joseph O'Kelly as his father and attributing information to bible of Rev. Marsassin Joseph O'Kelly in possession of Henry Grady O'Kelly, Danielsville, Georgia, in 1969). [S27] John Wright Boyd, A Family History: Lt. Thomas Fortson, etc., above, pp. 175-76 (naming Rev. Marsassin Joseph O'Kelly as her father and attributing information to bible of Rev. Marsassin Joseph O'Kelly in possession of Henry Grady O'Kelly, Danielsville, Georgia, in 1969). [S27] John Wright Boyd, A Family History: Lt. Thomas Fortson, etc., above, pp. 175-76 (naming Rev. Marsassin Joseph O'Kelly as this child's father and attributing information to bible of Rev. Marsassin Joseph O'Kelly in possession of Henry Grady O'Kelly, Danielsville, Georgia, in 1969). [S27] John Wright Boyd, A Family History: Lt. Thomas Fortson, etc., above, pp. 175-76, 181 (naming Rev. Marsassin Joseph O'Kelly as his father and attributing information to bible of Rev. Marsassin Joseph O'Kelly in possession of Henry Grady O'Kelly, Danielsville, Georgia, in 1969). [S27] John Wright Boyd, A Family History: Lt. Thomas Fortson (1742-1824) and Some of His Descendants—Early Settler of Elbert County, Georgia (Danielsville, Ga.: Heritage Papers, 1973), p. 175 (naming James O'Kelly as his father). [S27] John Wright Boyd, A Family History: Lt. Thomas Fortson, etc., above, p. 175 (naming Dicy _____ as his mother). [S27] John Wright Boyd, A Family History: Lt. Thomas Fortson, etc., above, p. 175 (naming William J. O'Kelly as his father). [S27] John Wright Boyd, A Family History: Lt. Thomas Fortson (1742-1824) and Some of His Descendants—Early Settler of Elbert County, Georgia (Danielsville, Ga.: Heritage Papers, 1973), p. 175. Marriage*: He married Dicy _____. Marriage*: She married James O'Kelly. [S27] John Wright Boyd, A Family History: Lt. Thomas Fortson (1742-1824) and Some of His Descendants—Early Settler of Elbert County, Georgia (Danielsville, Ga.: Heritage Papers, 1973), p. 175 (naming Dicy _____ as his mother). [S27] John Wright Boyd, A Family History: Lt. Thomas Fortson (1742-1824) and Some of His Descendants—Early Settler of Elbert County, Georgia (Danielsville, Ga.: Heritage Papers, 1973), pp. 175-76 (naming Rev. Marsassin Joseph O'Kelly as his father and attributing information to bible of Rev. Marsassin Joseph O'Kelly in possession of Henry Grady O'Kelly, Danielsville, Georgia, in 1969). [S27] John Wright Boyd, A Family History: Lt. Thomas Fortson, etc., above, pp. 175-76 (naming Alice Lenora Fortson as his mother and attributing information to bible of Rev. Marsassin Joseph O'Kelly in possession of Henry Grady O'Kelly, Danielsville, Georgia, in 1969). [S27] John Wright Boyd, A Family History: Lt. Thomas Fortson, etc., above, pp. 175-76 (attributing information to bible of Rev. Marsassin Joseph O'Kelly in possession of Henry Grady O'Kelly, Danielsville, Georgia, in 1969). [S27] John Wright Boyd, A Family History: Lt. Thomas Fortson, etc., above, p. 176 (giving the date but not the place and attributing information to bible of Rev. Marsassin Joseph O'Kelly in possession of Henry Grady O'Kelly, Danielsville, Georgia, in 1969). [S27] John Wright Boyd, A Family History: Lt. Thomas Fortson, etc., above, p. 176 (attributing information to bible of Rev. Marsassin Joseph O'Kelly in possession of Henry Grady O'Kelly, Danielsville, Georgia, in 1969). [S27] John Wright Boyd, A Family History: Lt. Thomas Fortson (1742-1824) and Some of His Descendants—Early Settler of Elbert County, Georgia (Danielsville, Ga.: Heritage Papers, 1973), pp. 175-76 (naming Rev. Marsassin Joseph O'Kelly as her father and attributing information to bible of Rev. Marsassin Joseph O'Kelly in possession of Henry Grady O'Kelly, Danielsville, Georgia, in 1969). [S27] John Wright Boyd, A Family History: Lt. Thomas Fortson, etc., above, pp. 175-76 (naming Alice Lenora Fortson as her mother and attributing information to bible of Rev. Marsassin Joseph O'Kelly in possession of Henry Grady O'Kelly, Danielsville, Georgia, in 1969). [S27] John Wright Boyd, A Family History: Lt. Thomas Fortson (1742-1824) and Some of His Descendants—Early Settler of Elbert County, Georgia (Danielsville, Ga.: Heritage Papers, 1973), pp. 175-76 (naming Rev. Marsassin Joseph O'Kelly as this child's father and attributing information to bible of Rev. Marsassin Joseph O'Kelly in possession of Henry Grady O'Kelly, Danielsville, Georgia, in 1969). [S27] John Wright Boyd, A Family History: Lt. Thomas Fortson, etc., above, pp. 175-76 (naming Alice Lenora Fortson as this child's mother and attributing information to bible of Rev. Marsassin Joseph O'Kelly in possession of Henry Grady O'Kelly, Danielsville, Georgia, in 1969).